It’s one thing to talk about the 'enduring appeal' of a motorcycle. It's quite another for that appeal to translate into solid showroom sales, year after year. There are a handful of bikes that have stayed in production for decades, essentially unchanged—Royal Enfields and Urals spring to mind. But the king of that particular hill is the Yamaha SR400, a bike that has been punching above its weight for over 35 years. 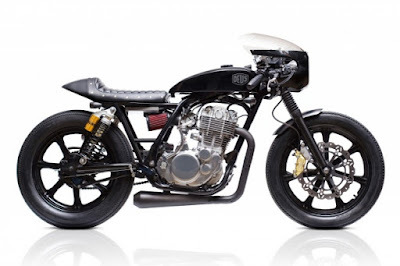 Not surprisingly, there's a huge array of aftermarket parts available for the SR400. It's a mainstay of the thriving Japanese custom scene, and it's now available again in the USA—this time with fuel injection. If you’re tempted to lay down some cash for a new model, or even dig out a secondhand one, take some inspiration from these five great recent builds. 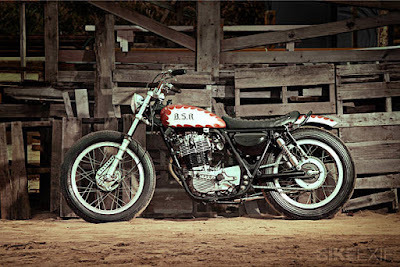 Outside Japan, the Australian company Deus is probably the greatest exponent of the custom Yamaha SR400. 'Grievous Angel' is one of Deus' signature builds, with looks that have scored it a place in Sydney's Powerhouse museum. This SR400 is sporting a tweaked frame, an alloy bullet-style fairing, beadblasted engine cases, a CV carb and a K&N intake kit. 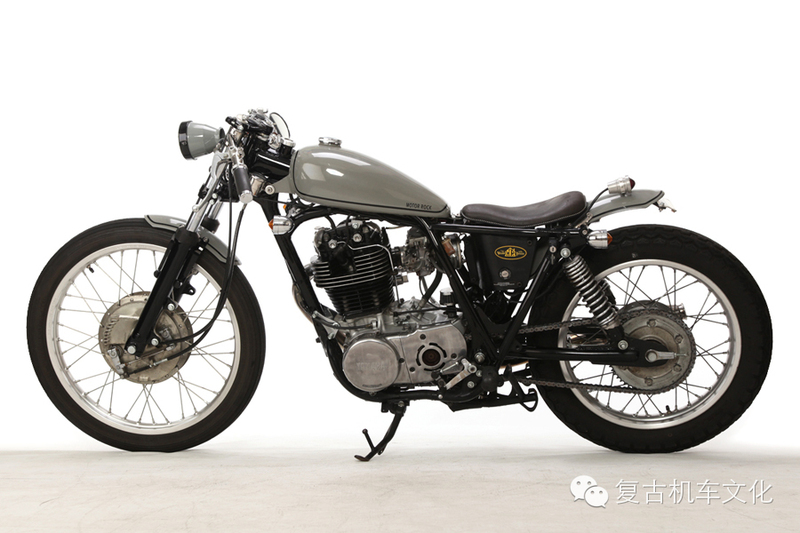 The tank and ducktail seat unit are from the legendary Japanese brand Nitroheads, and the tires are classic Avon Speedmasters. 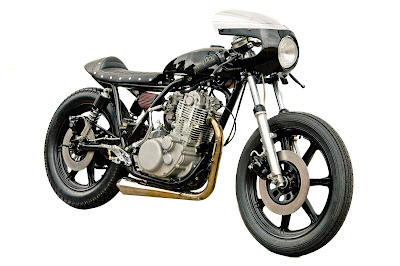 With so many custom SR400s around, it's hard to find one that's truly different. 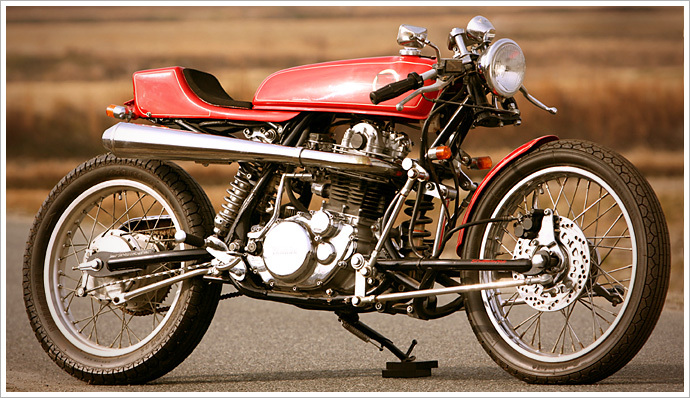 This machine from a little-known Japanese workshop fits the bill, with radical hub-center steering and a pair of shocks tucked under the custom seat unit. The tank is from a Honda Dream 50 and the lovely pipe is from an XS650. 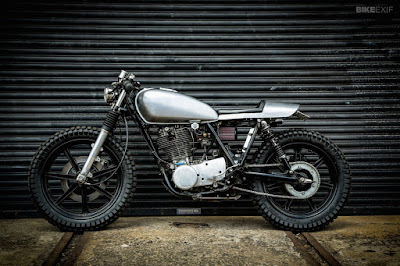 Hiroshima-based Skull built this machine a couple of years ago as a showcase for their fabrication skills, and not surprisingly, it whipped the Japanese custom scene into a frenzy. Sometimes simple is best—especially if you're after a daily rider, a role the SR400 fulfils admirably. 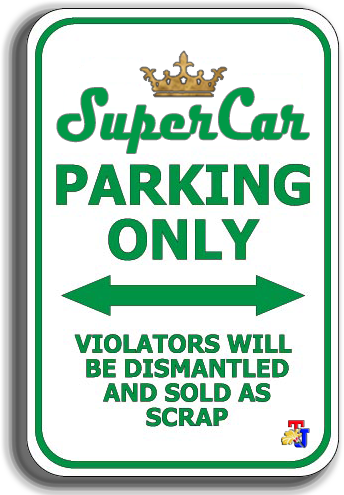 We’re back to Australia for our third choice, this time to East Sydney’s Gasoline Customs, a workshop of some 20 years' standing. 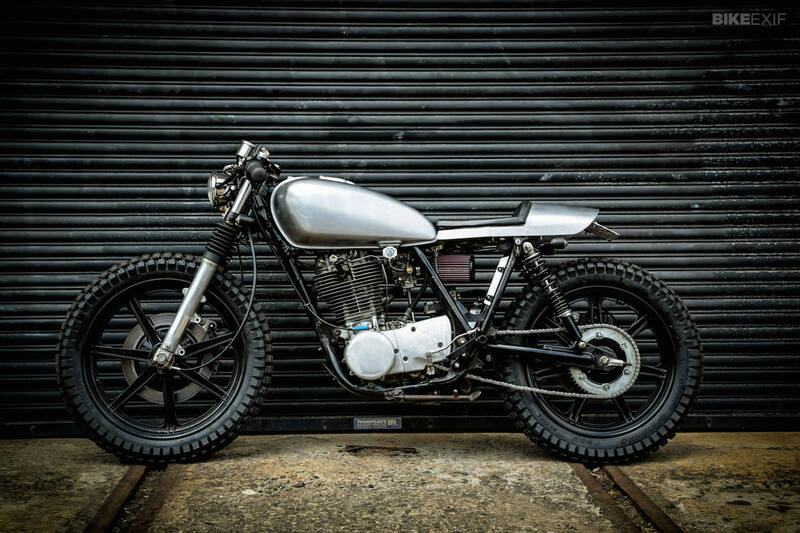 There's no rocket science in this build, but it's beautifully judged—from the powdercoated XS650 wheels and brake rotors to the reworked frame and minimalist tail unit. The exhaust system is as simple as it gets, but adds to the industrial vibe of the machine. The tires, in case you’re wondering, are Shinkos originally designed for trials use. There's relatively little 'formula' in Japanese custom building, compared to the West. You'll often see the top workshops building a Kawasaki bobber one week, a Triumph café racer the next, and a Harley with skyscraper-high ape bars the week after that. Motor Rock of Nagoya is one such shop. 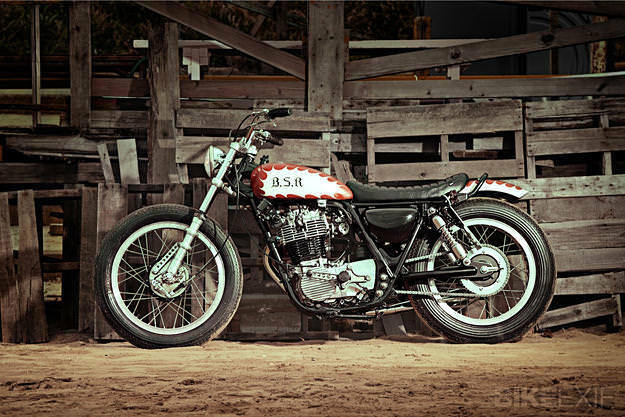 Since opening for business ten years ago, they've built 20 Yamaha-based customs—most of them super-clean SR400s. Like many Japanese bikes, this one looks a little off-kilter to Western eyes. But it has a strangely appealing charm: there’s a hint of bobber styling at the back end, and a touch of café bike at the front. The detailing is beautiful, and the paint on the tank is to die for. At the EICMA motor show 2013 in Milan, Yamaha Europe caused a splash by showcasing three 'Yard Built' customs. One came from the Wrenchmonkees, one came from Deus Milan, and one came all the way from Japan itself. 'Boogie Single Racer' was built by one of Tokyo's top customizers—who officially remained nameless—and just drips with style.